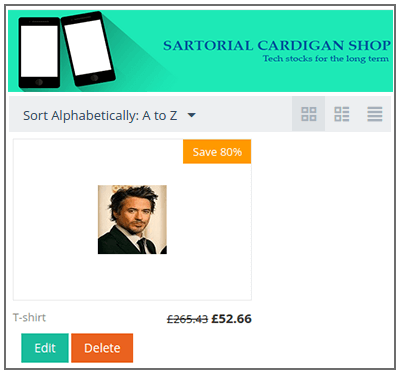 CS-Cart Multi Vendor Marketplace : Now convert your existing CS-Cart stores into Multi-seller Marketplace This imposing Add-on enables the user to convert multiple CS-Cart stores into full fledged marketplace. 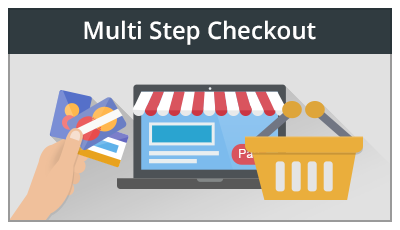 It is the multi-functional shopping cart solution for building eCommerce web content incorporating multiple independent seller with separate profile. In a matter of a few easy steps, you will be able to create a sophisticated, full-fledged online marketplace where all your sellers can manage their sales through one common web interface. Did you buy CS-Cart Multi Vendor Marketplace? What is the difference between CS-Cart Multivendor Edition and your CS-Cart Multivendor Marketplace addon? Does this addon supports separate seller profile ? Does this addon allow seller / vendor to list their product? Can I run Multivendor marketplace with multiple stores of CS-Cart? Yes, Our addon supports multi store feature of CS-Cart. Is there any option to set seller Pay limit for seller payout? 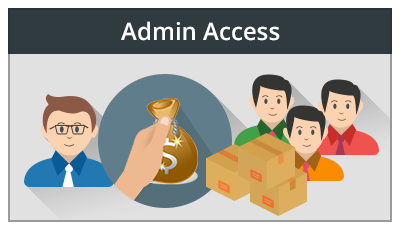 Yes, Admin can set seller pay limit in the addon settings globally applicable for each seller or he/she can also set the pay limit for individual vendor as well. How will seller commission work? order of 100$, 80% will be for seller and 20% for admin. 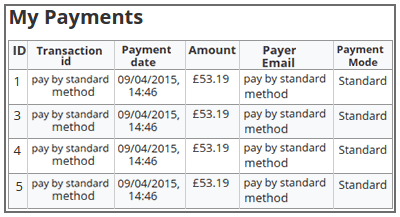 We have provided two payment methods (Paypal and standard payment method) for payment at customer end. There is no auto transfer to the seller account rather admin will get the complete amount and the admin can deduct his commission amount and transfer the payment to the seller by cheque/ Bank transfer or any other medium. How sellers can register themselves at store? Is there any option to customize the registration form? 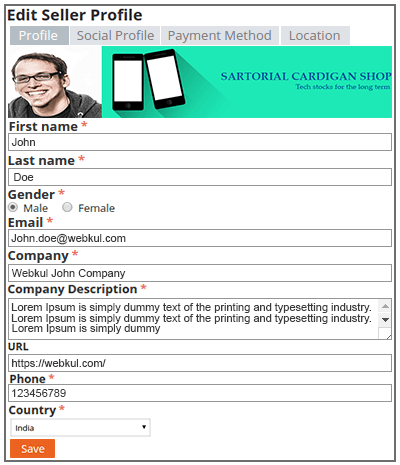 Seller can register themselves via frontend. 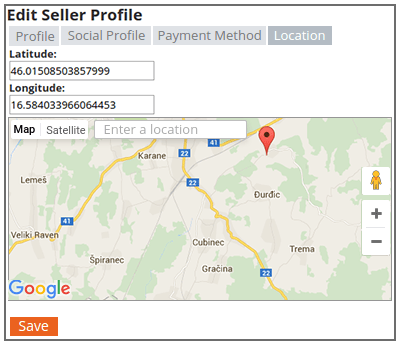 A block for seller account need to be added in the layout part at backend. No, there is no option to customize the seller registration form. Further code modification will be required for that. Yes, there is a tab viz; Ask To Admin under Seller Account section where seller can ask admin for any query. How will seller/vendor monitor the sales ? 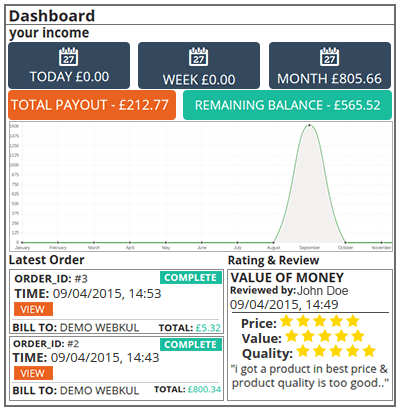 A dashboard at front end has been provided to seller to monitor and manage the sales of his products. Is it possible for seller to upload products on store in bulk. No, We have not yet provided this feature for vendor. This can further be customized. Can a seller add product options? 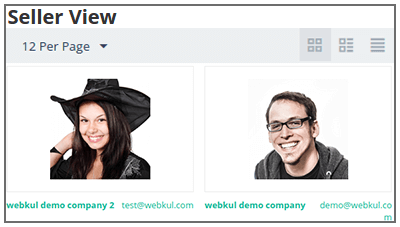 Yes, A seller can add and manage product options. When seller uploads a new product, product will be in pending state. After the admin approval , product will go live on store. 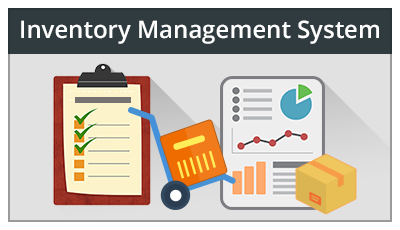 Also admin can set it automatic so that for every product upload admin don't need to check the product upload. 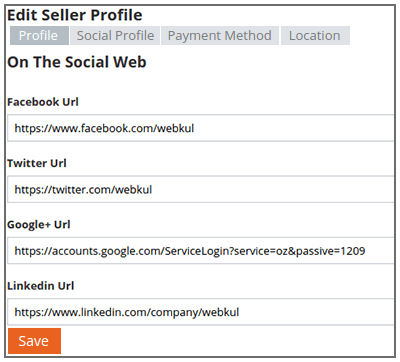 Yes, Seller can add his social profile links under seller profile at frontend. Can a customer contact to seller ? No, Customer just can view seller's profile. How the seller feedback, review and ratings are getting managed ? 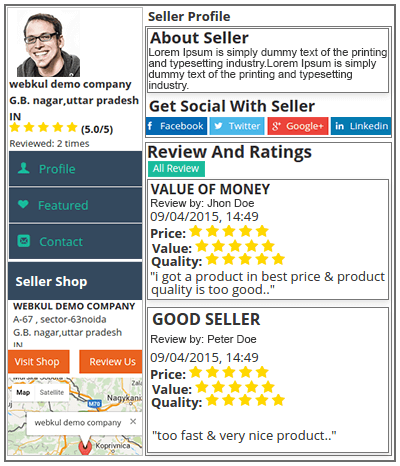 Under seller profile customer can see the feedback meter where he can also add the feedback. An eye catching view for seller profile along with the map location of seller has been provided at front end. .